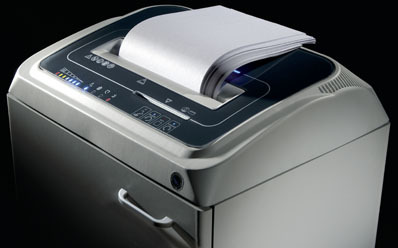 A mid-size strip cut office shredder comes equipped with 2 separate cutting heads: one for paper and one for CDs, DVDs and credit cards. New precision designed carbon hardened cutting knives allow for higher shred loads with lower power consumption. Easily handle staples and paper clips. 24 hour continuous duty motors with heavy duty chain drive and steel gears. 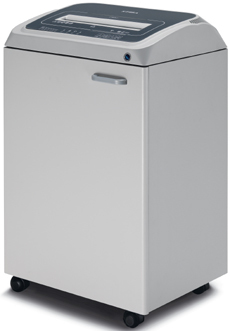 "ENERGY SMART®" power saving technology puts the shredder into a power saving stand-by mode after just 8 seconds and switches off automatically after 4 hours of non-operation. A Touch Screen operations panel includes indicators for bag full, door open and an oiling reminder. An Electronic Power Control system monitors and displays the shredding load to maximize shredding capacity. Also features Auto Start/Stop operation and Auto Reverse for accidental jams.